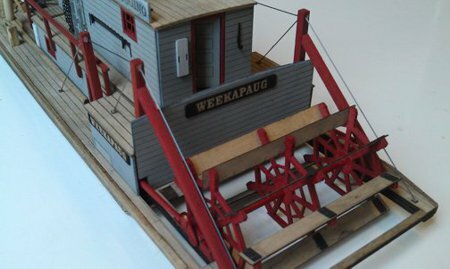 This kit is an updated version of the O scale tug that is super detailed and slightly scaled down to 1:64 scale. 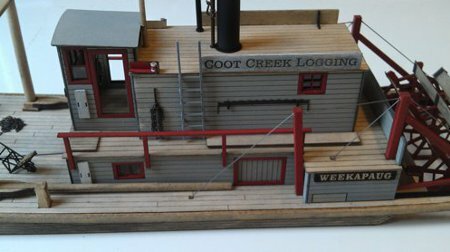 The logging tug has design features prototypical of the small sternwheeler watercraft used on rivers, lakes, tributaries, bays and swamps. Time frame could be as early as the 1860's to as late as the 1930's depending on details. 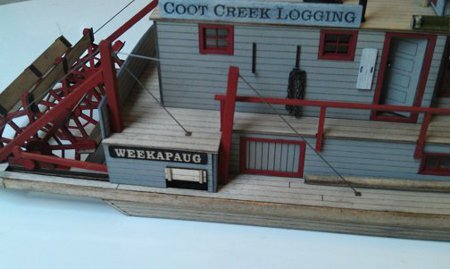 Kit has a fully detailed pilot house; bunk house; the windows, hatches and doors may be set open or closed; hand cart; hooks; billboard signage; two loading booms; saw; stacking knees; life floats; various metal parts and custom pewter castings from Crow River. There is decking inside the tug so the interior can be fully detailed (if desired). 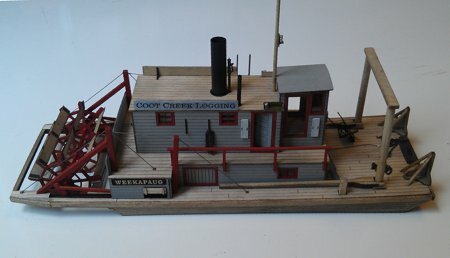 These kits are made unique with a client supplied boat name and logging company which is "lazed" into the wood. Use contact form to submit tug name and logging company.